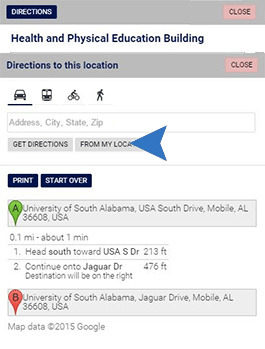 Interactive Campus Map is developed and maintained by the University of South Alabama Web Services group. Map background, Satellite imagery and Street view images are provided courtesy of Google Maps. USA community including Faculty, Staff and Students may request updates to the Interactive Campus Map. 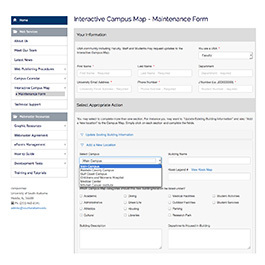 To add, remove or update locations, update building information or report any issues related to this application simply complete the “Interactive Campus Map - Maintenance Form”. In the upper right corner of the map, you can find map controls. Zoom - displays a "+/-" buttons to control the zoom level of the map. MapType - allows you to toggle between map types (Roadmap and Satellite). Street View - displays a Pegman icon which can be dragged to the map to enable Street View. 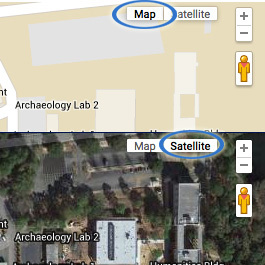 Each icon on the map is related to a location and the symbol identifies the category. You can switch to a different campus by using dropdown. Click a category name to view an expanded list of related buildings, parking lots, or locations. Notice that the Student Services category is expanded by default when the map is opened. All the purple icons point to building locations on campus. Select the category’s checkbox to reveal icons for each location in the selected category. 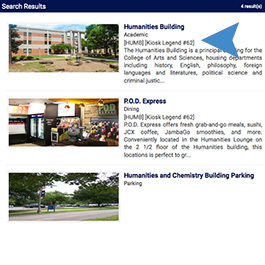 Select a specific building in the expanded list to view details and see departments housed in the building. Click an icon on the map or a location name in the left navigation to open an extra wind pointer which helps you pin point a building’s location on the map. Click a pointer on the map or a location name in left navigation to view location information. 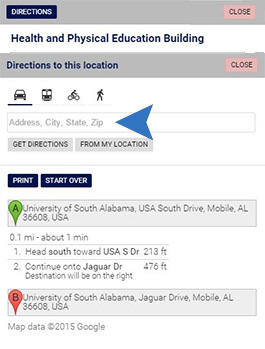 Click “Directions” in the upper left corner of the location detail screen to obtain directions to the location. Click “Close” in the upper right corner of the location detail screen to close the window and return to left navigation panel. If prompted, allow the app to use your location. Remember that directions are generated by Google Maps and are based on streets and may not take you to the door or parking lot. Enter your current location including street address, city, state, and zip. If on campus, you may be able to enter the building name for the building nearest to you rather than the street address. For example, Meisler Hall, Mobile, Al 36688. 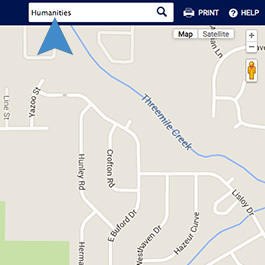 Use the powerful search tool in the upper right corner of the map window and enter a building abbreviation, name, or number as it is listed on the map kiosk and then click enter to view the search results. In the search results screen, click the desired location from the selections available to view the location information.